Most homeowners go to great lengths to make their property appealing by creating beautiful exteriors. 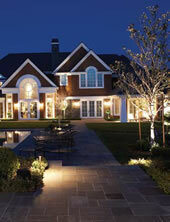 Landscape lighting is then used to complete the picture perfect look every time the night falls. Not only does this enhance the way your property looks, but it adds value to it in addition to enhancing security in your home. There is no better way to create a dramatic look than outdoor lighting done properly. 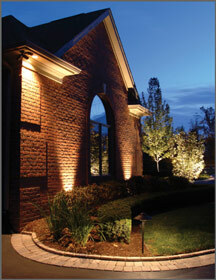 Our landscape lighting is professionally installed, and comes with a 10 Year Warranty. Landscape lighting using low voltage power that creates a subtle mood in your garden is becoming more and more popular. You can install facade lighting that highlights flat surfaces and other features, in addition to placing lights along pathways for safety and beauty. Another trend in lighting the exteriors is the use of solar power. Solar landscape lighting stores power from the sun during the day and switches on at night. Utilizing solar lighting will reduce needed wiring and save on your utility bills. For any resident of the Buffalo NY region embarking on a lighting project, the main considerations are design and budget. Contact WNY Lawn and Landscape for a one-on-one assessment and design. We will work with you to identify the features you want the lighting to highlight and help to decide what kind of an atmosphere you want to create. You receive professional care from start to finish with outdoor lighting service from WNY Lawn and Landscape. Our professional landscaper designers help you with all the work of planning, design and selecting suitable lights. From there, our installation team will take over. Your lighting plan is designed to place lights discreetly such that they are not obvious. Each type of lighting chosen is used to create a different effect and the way the lights are positioned also determines the overall effect. High quality lighting products from FX Luminaire and Vista Professional Outdoor Lighting will ensure that the materials used are durable, hard wearing and can withstand the harsh WNY climate.